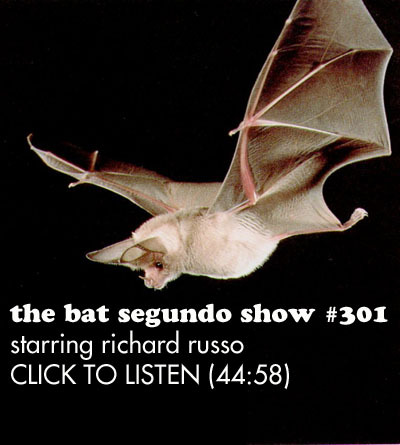 Richard Russo recently appeared on The Bat Segundo Show #301. Richard Russo is most recently the author of That Old Cape Magic. He previously appeared on The Bat Segundo Show #152. Condition of Mr. Segundo: Shoving Cape Cod mackerel down his throat. Correspondent: Was “Living on a Prayer” the tune that was more applicable to weddings here? Russo: Ed, Ed, you’re trying to make me feel regret now, aren’t you? Because that would have been perfect as well. Correspondent: Was it more about living than love? With the emphasis in the book. Russo: It was the result of my wife and I having gone recently to a number of weddings and being absolutely fascinated by the way young people my daugghters’ age react to the song. Because it is so much before their time. And for a lot of young people — 28, 29, 30 — it is a kind of anthem And the way they not only know the words, they have a kind of routine worked out on the dance floor. Those in the know have this routine on the dance floor that involves the fist-pumping, which they do in unison. Sometimes forty or fifty of them, young people out on the dance floor, to a song that is just so much before their time. But they’ve adopted it. So it was a wonderful way to show a bridge between those generations. And Laura, who does such a kind act in that redeems her father, at least temporarily. It just fit that slot so nicely. It also suggests that when Griffin begins this novel, he’s had a tiff with his wife. But it’s really just a tiff. I mean, he has a kind of tenure in his job. He loves his life. He loves his wife. He loves his daughter. Everything is right. And yet by the end of the first half of this book, he’s living on a prayer. And he knows it. Whereas he didn’t in the beginning. Correspondent: But it’s interesting. Because your timing is absolutely perfect! Recently, on YouTube, there’s this video that’s been going around, that 18 million people have seen, of this elaborate dance at a wedding all set to music. Russo: Oh really? I hadn’t seen it. Correspondent: Well, I know. I don’t think you’re much of an online guy. Correspondent: Griffin is pressured into home ownership. And he and his wife often sift through the real estate catalogs, splitting up properties into Cannot Afford It and Wouldn’t Have It As a Gift. Correspondent: And then also, 13-year-old Sunny Kim says, “You have a lovely home,” later on in the book. Home though is not necessarily where the heart is in this. This is a couple that is united by home as a piece of property, as opposed to a place where one can establish a family. This is a couple that settles on The Great Truro Accord and actually figures that this prearranged stratagem will aid them in deflecting every curveball of life thrown their way. So I wanted to just ask you why the home, of all things — or even just property in general — would be the central place for this couple’s failure to (1) deal with life and (2) come to the real terms that they are their parents and that they share a lot of family qualities. That’s a lot of points. I’ll stop there. What a love-bug he is. And such a pleasure to hear you both enjoying your conversation. The smile (and the stubble) says it all. I have to agree – another great show with Russo.